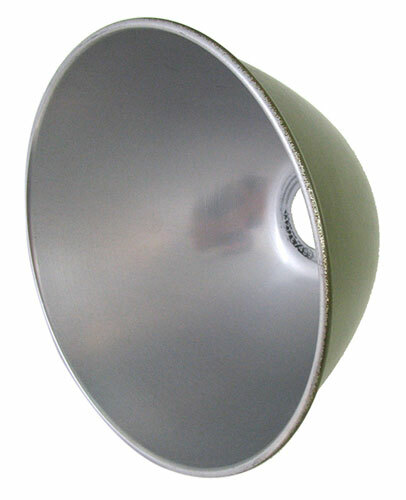 This Olive Drab painted on the outside and shiny, reflective silver on the inside aluminum lampshade from Uncle is 7” dia at the bottom x 4-1/8” tall with a 1-5/16” hole non-threaded, in the top for the bulb. Plug the hole and it’s a bowl! They're back! 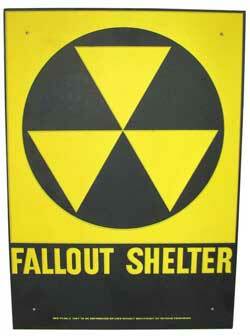 Those of a certain age will remember being taught to crouch under their school desks in case of nuclear attack. 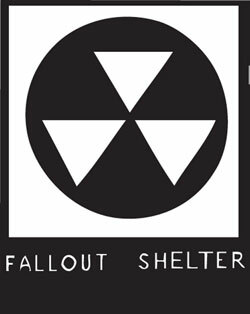 Shortly thereafter, the United States gov't, in its infinite wisdom zoomed about the cityscape plastering yellow and black signs on buildings with basements to designate them as fallout shelters wherein it stored cans of water and radiation meters which were so insensitive that any reading could only mean the past tense of crispiness. We have a quantity of these signs, brand new in the sense that they have never been plastered, but antique in the sense that they are Cold War originals and may show slight wear from being stored. 10" x 14" , 25 ga. galvanized steel. They have a black base coat on the front over sprayed with orange/yellow reflective paint in the familiar design rendered nearby by our faithful artist. This is a true collector's item fetching $50 and up in antique stores! A tasteful addition to even the dullest basement hangout. You will survive, too, just like Gloria Gaynor, and in the woods, even. 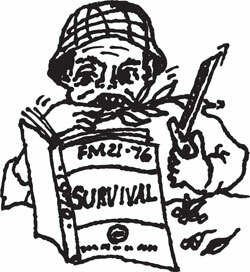 But only if you have this U.S. Army manual, cleverly titled: SURVIVAL, Department of the Army Field Manual FM21-76. 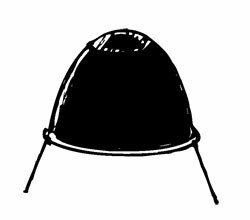 It's 287 heavily illustrated pages of techniques for staying alive (add your own BeeGee jokes here) including orientation, food & cooking, fire- and shelter-making, rafts, animal, insect and plant recognition, and much more. 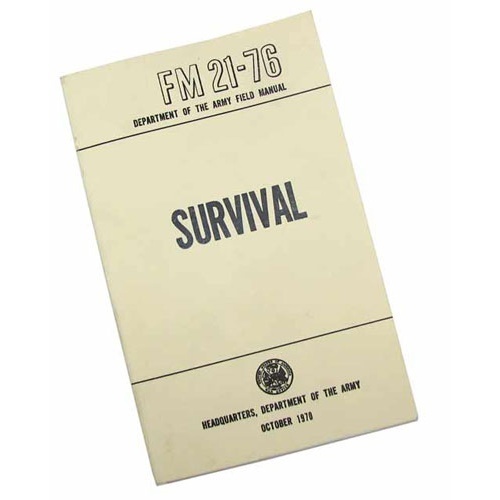 This is the 1970 edition, but staying alive in the woods hasn't changed a whole lot since then. In soft-cover. 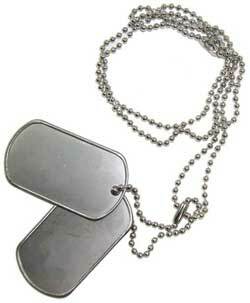 Blank dog tags, ready to punch. Each set measures 2" x 1-1/8" x 1/32" thick in matte stainless steel with (2) ball chains, one 24" long and one 4-1/2" long. 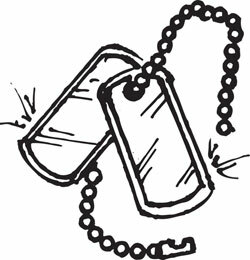 You get (2) sets of (2) tags, with (4) chains altogether. Made in the USA. 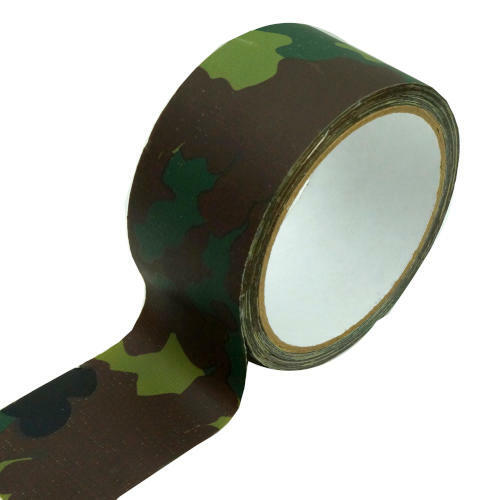 Wrap this digital camo cloth tape around your camera, rifle stock, spotting scope, lunch box, selfie stick or brother-in-law and make them all disappear in the woods. Our each is a roll of 2” wide x 33 feet of “Easy-Peel” tape. These just in, special for military strap aficionados. 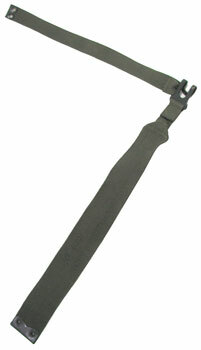 Right angle olive-drab canvas strap. The wide part measures 17" x 2" and is sewn onto a U-shaped steel clip with a 13-1/2" long x 1" strap mounted at right angles to it. Both straps have steel ends with (2) 3/16" holes. Quite useful for something, we're sure.